DIRECTIONS: Starting at Fenagh Visitor Centre, continue to Fenagh village and go up the hill on the Ballinamore Road. Take first left signposted Lough Reane and walk for approx 200 yards – on your left the Dolmen and its ivy roof can be seen in the distance. 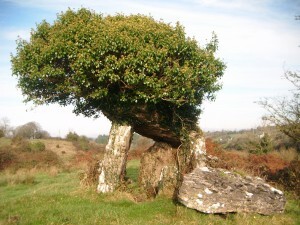 The Dolmen is not accessible at present. If you continue along this road Lough Rean will come into view more clearly.